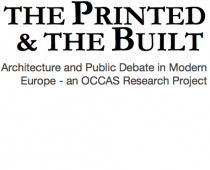 This international symposium is part of the ANR research project Mapping Architectural Criticism, in which Printed & Built member Anne Hultzsch is involved. The network aims to develop a field of research on the history of architectural criticism, from the last decades of the 19th century to the present day. The symposium intends to debate two key questions related to the geographies of criticism: what are criticism’s disciplinary boundaries and which territories has criticism shared from the last decades of the 19th to the end of the 20th century with other disciplines. In the first place, the symposium interrogates the overlapping of architectural criticism with different kinds of architectural writing, in particular those pertaining to architectural history and theory, but also those stemming from other disciplines. The symposium is equally aimed at highlighting the relationships, the common terrains, and the conceptual tools that architectural criticism has in common with other genres of criticism, such as art criticism and literary criticism.